One of the biggest contributors to fuel costs for fleets of all sizes is idling time. Think of vehicle idling like a silent killer of your company’s fuel efficiency… and in the bigger sense, your bottom line. Luckily, there’s a simple way to take control of costs incurred by your drivers idling: installing Geotab GPS Fleet Tracking Devices on your fleet. 2 minutes of idling is the equivalent of 1 mile (1.6 km) of driving. In the United States, that’s equivalent to over $13 million per day. 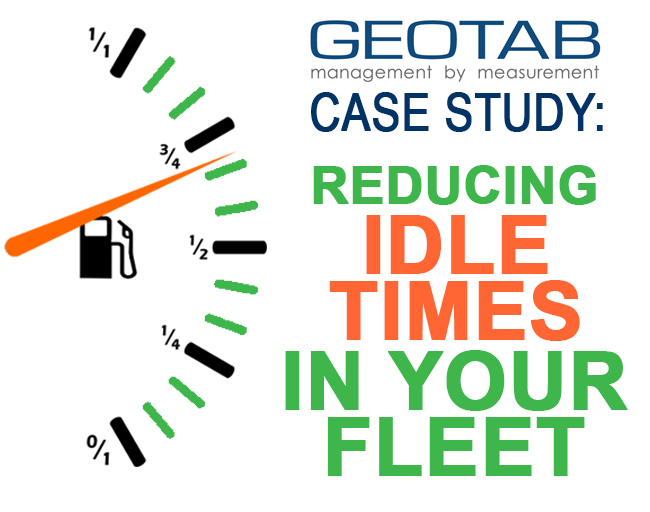 In this case study provided by Geotab [ original pdf version here ], we’ll take a look at one company that had some amazing success in reducing their fleet’s idling time, allowing them to cut way back on fuel consumption and fuel costs. Crown Uniform & Linen Service serves a wide area in New England, with service in Massachusetts, Connecticut, Maine, Vermont, New Hampshire and Rhode Island. The company serves thousands of customers and recently celebrated its 100th year in business. Its vehicles tend to make around 30 to 40 stops per day, traveling 100-150 miles (approximately 160 km – 240 km) per day. The company says that they’ve long had an interest in reducing their idle times, both to slash their costs, and for the environmental benefits of reduced idling. Dave Hardy, the company’s fleet supervisor, said there was lots of room for improvement. To establish a baseline for progress, he calculated that each vehicle was idling about 70 minutes each day, and that there were even some drivers who were idling for about 2 hours to 5 hours per day. First, the company opened the lines of communication regarding idling with their local managers. They found that many of the managers had no sense of how much their drivers were actually idling over the course of a day. Crown Uniform & Linen implemented Geotab GPS Tracking Devices in 30 of their service vehicles, and once the managers were on the same page with the company’s anti-idling guidelines, set a new goal for 10 minutes of idling per driver, per day. Using the Geotab data, Hardy created a daily report to keep tabs on the company’s progress and shared those reports with the local managers. The managers took those reports and reinforced positive behaviours with their drivers. Within a few months time, the drivers of the vehicles with the Geotab tracking devices reduced their idle times from 70 minutes per day, down to 7 minutes per day – a 90% reduction. The behavior of those 30 vehicles is saving the company about $1500 – $2000 per month in fuel costs. With the staggering success of their anti-idling program thus far, the company is planning to extend it to their sales fleet, which should lead to even greater fuel savings over the long haul. Does your company have an idling problem? Take the first step towards reducing fuel costs and your fleet’s environmental impact with Geotab GPS Fleet Tracking from GPS to GO. It’s the best fleet tracking solution on the market today, and offers your business so many benefits beyond simply reducing your fleet’s fuel consumption. Best of all, there’s no major commitment required to start testing Geotab with your fleet. Get rolling with our $50 trial offer. We send you the plug-and-play fleet tracking devices, and you test them out with your fleet. There’s no contract, no obligation, and you’re free to cancel anytime. When you’ve seen the results firsthand and you’re ready to purchase, we’ll credit the $50 to your account. It’s the easy way to put your fleet on the fast track to fuel savings.